Word Search game for free: You will see a collection of images and you will have to guess and find the proper words in a Word Search puzzle.★ Available in 14 languages: English, Spanish, French, Portuguese, Russian, German, Italian, Swedish, Polish, Czech, Slovak, Ukrainian and more.★ Play Word Search challenges with more than 20 levels with different categories: flags of the world, animals, foods, vegetables, retro, toys, travels, transports and much more.★ 13 Achievements and Leaderboard (Social and Everyone) from Google Play Games.★ You will never get bored with this game! more levels are uploaded periodically. Prepare yourself for a new challenge every time.★ Defy your friends with a 1 vs 1 multiplayer Word Search.★ Choose the difficulty you want: from 10 x 10 puzzles up to 14 x 14 games perfect for tablets.★ You will never lose your current game, the game is automatically saved so you can continue right where you left off.★ Available for your mobile phone, 7 inch tablet or 10 inch HD devices and small or low resolution devices!Enjoy a full-color set of hundreds of images to find. 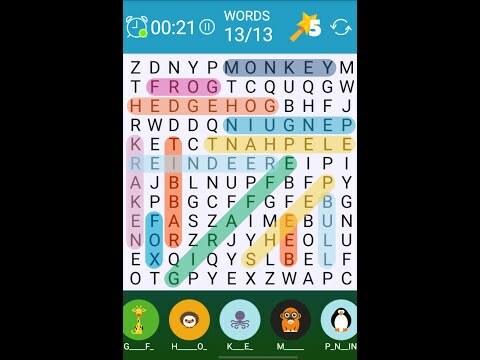 If you like Word Games you need to try this one!